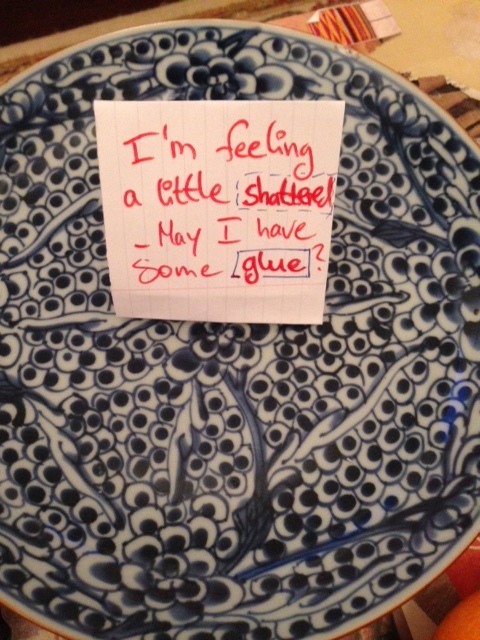 I’m feeling a little shattered – may I have some glue? We had a team day out on Friday. I was kind of dreading it, wondering what a day of imposed fun would be like. I was feeling under pressure, we all have so much on our plates that the idea of having to down tools at such a busy point in our membership year made me feel a bit panicky. But in all honesty, I had the best day ever. It was a perfect mix of socialising and problem-solving, team-building stuff. I went in feeling completely shattered and came out feeling energised and realising that setting aside time is the glue that holds us together so well. And I realised again, as I have several times since joining my new team in December, how important it is to invest in the culture of your workplace. The investment doesn’t have to be financial, but it does need to be well thought out, the rationale needs to be explained and it should be the right frequency and variety of activities that give your staff the feeling that they are valued, their opinions matter and that their worth extends beyond just the work they do. This starts with the working day and extends to how we use our time. We are employed to work 37 hours a week. You can manage your hours however you choose to cover this. Come into the office any time before 10am and leave any time after 4pm. We are trusted to put in the work to get the job done. We don’t need to clock in or clock out and no-one will frown at you if you leave on the dot. This means that not only are we trusted to get the job done, but we are given legitimisation to sleep in if we feel tired that morning, or to fit in that much needed run before work. Our own rhythm and needs are allowed a place and we are allowed to listen to them. Similarly, we are trusted to decide how we will get things done, and we are encouraged to build in time to think and reflect, where other workplaces will want to see tangible busy-ness and apparent productivity marked out by meetings and doing. We know each others’ objectives and are clear how each of our objectives fit into the strategy for the organisation as a whole. We share what we want to achieve over the coming six months, and can break this down into weeks and days. We share what we are working on in team meetings and we share what is stopping us from achieving what we feel we need to. That’s rare. We are transparent enough to point out that perhaps one week, the only thing that might be stopping one of us is our own procrastination, a sense of sluggishness or anxiety over getting started on a stage of work that needs to be done. And that’s okay. We hold each other to account. We challenge each other. We make time to invite challenge from others in the team. We expect everyone to hold us to account and help us deliver the highest quality work whenever relevant and appropriate. We also know that often what we are trying to achieve is complex and requires a long game or that there is a huge gap between what we would like to achieve and what we have the resources to deliver. But we still demand the highest quality that is possible within the given set of circumstances and nine times out of ten, I see my colleagues going above and beyond. We let each other know what they need to know from us. We do this frequently and always try to select the right channel for communication. Some things can be communicated by email, others need a conversation or discussion. Others still, will need an announcement that is better delivered in person. We commit things to paper and store them in a saved drive so that they can be revisited, shared, added to and revised. We communicate clearly and respectfully at all times. We consider how what we communicate will impact on and aid others’ progress with the things they are striving to achieve. There are times when feedback is gathered as part of the performance management process. But there is also time for feedback to be given one to one, ad hoc, in passing or to mark special achievements. Feedback is built in so it is neither a special occurrence, nor a cause for concern. We are not afraid to feed back when things didn’t go so well, and we are careful not to miss an opportunity to also do a post mortem on what went well and why. There is much that is celebrated. For example this quirky gem: whenever you see someone doing something commendable that is really above and beyond the call of duty, you can nominate them for the Challenge Champion award. They get to pick three possible ways to celebrate with the whole team from a jar and they get to drink their tea from the Challenge Champion cup until the next champion gets nominated. It’s a small thing, it’s could be seen as a little infantile by some, but adds a measure of surprise and joy. We might all have breakfast together to celebrate or go to a gallery one afternoon after work. The selection of celebratory things is modest but bonding and fun. There is so much fun. For example, once a week, on a rota, one of us brings ‘Something Interesting’ to the table for half an hour. These have been really interesting and inspiring, or sometimes just plain silly and filled with playful mirth. It might be a podcast or a TedTalk you enjoyed, a book you read or a concept you are grappling with. It might be a selection of odd foods no-one else know that you particularly find delicious (that was my contribution of course). It might be a game you learned recently or a puzzle for everyone to solve. Every time the Something Interesting session comes up, I think resentfully how this time could be better spent, and yet, every week I come away energised, enthused, enthralled and berating myself that I could have been so cynical. There are many ways that a place of work can inject elements of trust, transparency, fun or whatever you decide is important. The main point is that as an organisation, you spend the time defining what the things are that are central to your work culture, how you make people feel valued. It is essential once you have defined these that you actively build in time and space for them to be an integral part of the DNA of your organisation.